Normal granola is often delicious and a great breakfast recipe, but is often filled with fat and high in calories. My version of a more healthy breakfast granola is packed with flavor, but none of the fats that regular granola has and is so much lower in calories. 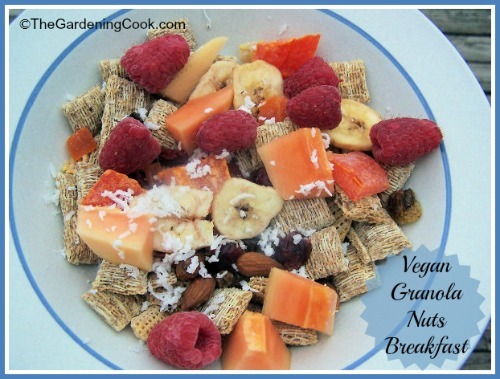 Top it with your favorite soy or almond and you have a filling and healthy breakfast. Healthy Breakfast Granola packs an Energy Punch. The trick to making a healthier version of granola is being smart about the ingredients. There is no need for lots of brown sugar, honey or other sweeteners. Dried fruit is quite sweet on it’s own and, to be honest, I have never really wanted a lot of sweetness in the morning anyway. At this time of the day, I am looking for something that will give me energy until lunch time, and the nuts will do that in spades. I used raspberries, whole wheat shredded minis, a dried fruit and nut mix, fresh mango and fresh shredded coconut. If you want a sweeter breakfast, you can add sugar, steviaor a sweetener of your choice. I prefer the raw taste of it just as it is and my soy milk is vanilla which is sweetened, so it is fine for me. For more breakfast ideas, check out these tasty breakfast recipes. What choices do you make for a healthy breakfast? Please leave your comments below. This healthy breakfast granola is a wonderful mixture of fresh fruit, shredded wheat, dried fruit and nuts and a helping of fresh coconut. Come all ingredients in a bowl and eat. I do not use sugar or sweetener because I enjoy the raw taste and the vanilla soy milk is lightly sweetened. You can add sugar or your choice of sweetener if you want it sweeter.